Park Hotel Yellowstone is located on Main Street in Gardiner, Montana just outside the north entrance and the only entrance of the park that stays open year round. 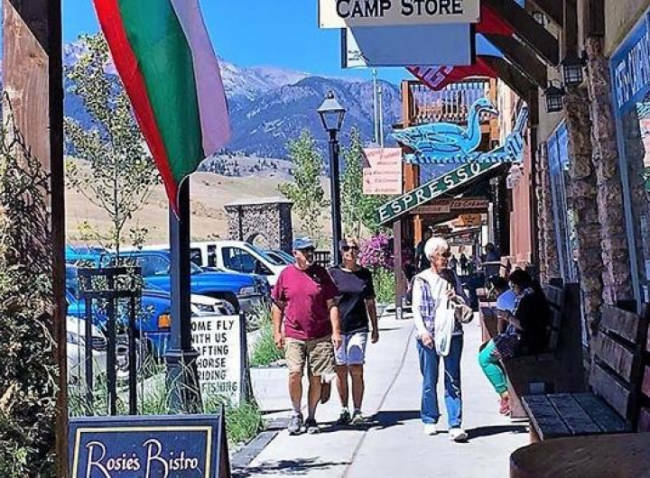 Conveniently located walking distance from the Roosevelt Arch within the park and various dining, shopping and activities in the area, Park Hotel Yellowstone is a great option for all seasons. 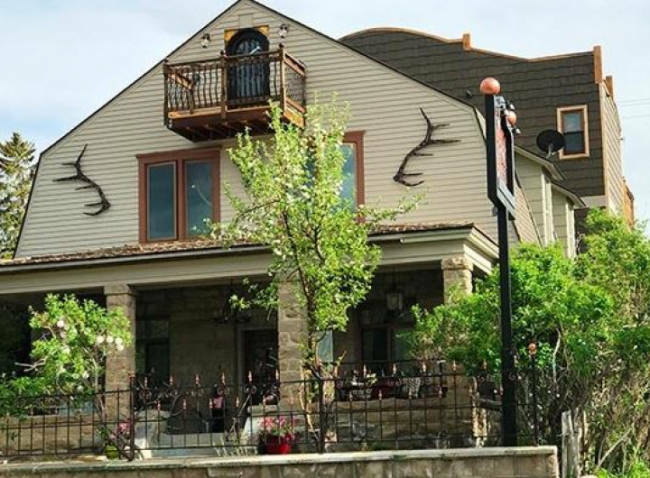 With tastefully renovated historic hotel rooms dating back to 1902, this quaint boutique hotel offers guests luxury while maintaining the rustic, western feel that you would expect from a vintage Yellowstone lodge. All 9 apartment-style rooms include either full kitchens or kitchenettes, satellite television, air conditioning, private bath, and free high-speed WiFi. In addition, most rooms feature park views and some include pull-out sofas and rock-walled showers. 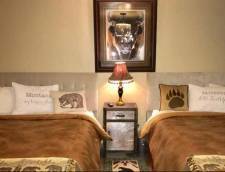 In addition to their beautifully renovated rooms, the hotel also has an outdoor terrace with a rock fire pit for evening campfires, private gated yard with a covered veranda porch with seating and activities and a barbeque grill. 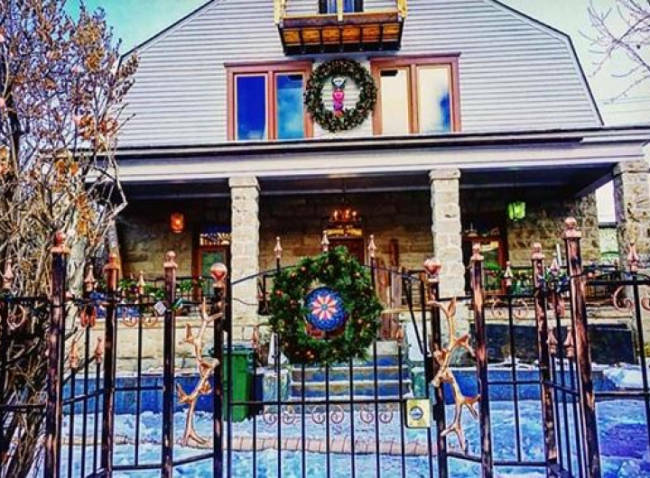 After a day of exploring in the park, take in all that the town of Gardiner has to offer within walking distance from the hotel or enjoy a nice home-cooked meal and a movie in your room. 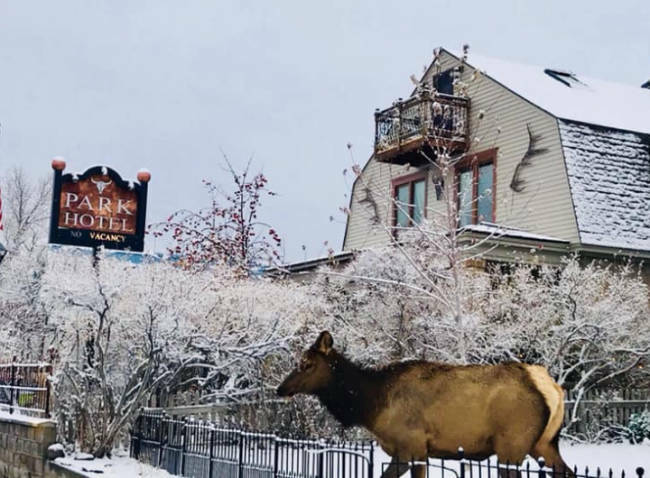 Park Hotel Yellowstone truly is a great option for those looking for convenience, luxury and that great, Main Street charm that this hotel offers. Located on the second floor, rooms 203 and 204 feature 2 queen beds with views of the park mountains and a spacious rock shower and smaller bathroom. These rooms can sleep up to 4 people. 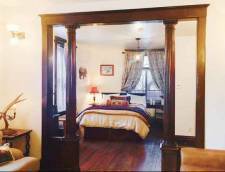 Located on the first floor, rooms 103 and 104 feature 2 queen beds with views of the alley on the park side, spacious rock shower, and a barbecue grill. These rooms can sleep up to 5 people with the addition of a rollaway bed. 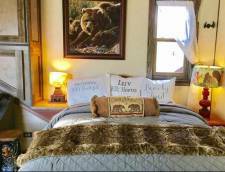 Located on the second floor, room 201 features 1 queen size bed and a bunk bet set with 2 twin beds with views of Main Street, the mountains and surrounding neighborhood. This larger suite includes a more spacious kitchen with an island, bathroom with a tub/shower combo, dining area, and sitting area. The suite can sleep up to 5 people with the addition of a rollaway bed. 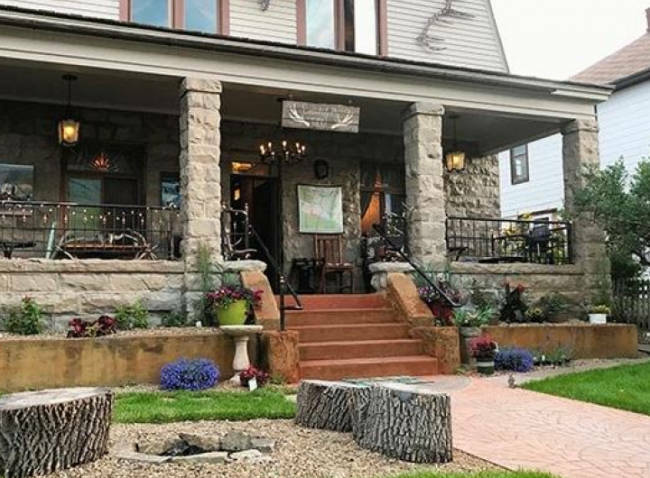 Located on the first floor, rooms 101 and 102 are connected rooms booked as one unit in the summertime and together feature 2 queen beds and 2 bathrooms with rock showers and views of Main Street, the mountains and surrounding neighborhood. In the fall, winter and spring seasons, the rooms are booked separately from one another, each with their own private entrance. 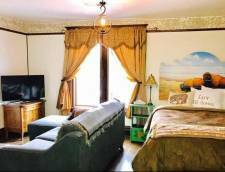 The suite also has a washer/dryer, living room with a historical fireplace mantle, 1 large deep sofa as well as 1 twin leather fold-out sofa with memory foam mattress. The suite can sleep up to 6 people with a rollaway bed. Located on the first floor, room 301 is the largest suite featuring 1 queen bed in the living area, 1 queen bed on the opposite end, fully stocked kitchen, dining area, 2 flat screen TVs, bathroom with rock shower, lounge sofa, large windows and a 40 foot private, outdoor deck viewing the park, mountains and town with outdoor seating. 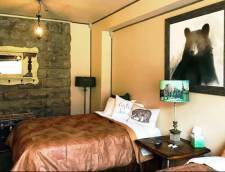 The suite also has a barbecue grill and can sleep up to 5 people with a rollaway bed. 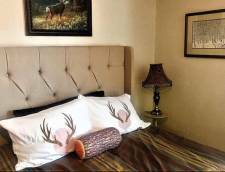 Located on the second floor, room 202 features 1 queen bed and view of Main Street, the mountains and surrounding neighborhood. In the kitchen, there is an island cart with padded stools and the bathroom has a rock shower. This room can sleep up to 2 people. Full payment of the entire stay is required at the time of booking. Outside 60 days $50 cancel fee, inside 60 days forfeit the entire amount. However, if canceled inside 60 days and the room is rebooked the entire amount will be refunded minus the $50 cancel fee. Pets with permission, $35 per stay. Has to be on a leash, be non-aggressive, not bark excessively, not be left unattended, not allowed on furniture. Overnight in a crate. Owners are responsible for picking up after their pet. If the rules are not followed, you will have to depart, no refund. Rates Policy: Rates are based on double occupancy. An extra person fee of $20 each per night will be added. During May 25 - August 15th a two-night minimum is required, rollaway beds and cribs are an extra $20.00 per night. If applicable, Guest agrees to pay for all damage caused to property or property of a third party, including without limitation, costs of repair and replacement of such damaged items. In addition, if lodging is left in such a state that housekeeping needs to spend extra time on the normal cleaning, an extra housekeeping fee may be charged. We operate with conservation in mind & will not be housekeeping each suite/rooms daily unless requested. Housekeeping occurs in between each guest stay. However, if you are in need of any additional supplies or assistance, we can help. Park Hotel Yellowstone does not have a 24/7 front desk on site.